NEW ALBANY, Ohio – Being a part of the Team USA Scholarship with as much history and prestige is certainly one of the coolest things I can say I have participated in to date. The program is known to identify and select the very best talents from each young group of drivers every year, and when I was selected, words cannot describe what a feeling it was. For me, it was the big break that I had been hoping for – for quite some time now. I have experienced a lot of success in the karting side of my racing career, and the jump to cars has been something that I had always dreamed of. Karting has played a huge role in my career. Up until last year, though, it seemed entirely out of reach. That element made the actual transition all the more special and has made me appreciate every single opportunity I get that much more. My first car race opportunity came at the second weekend in the 2017 F4 US Championship, taking place at the Indianapolis Motor Speedway. I did it with Jay Howard’s Motorsport Driver Development team. 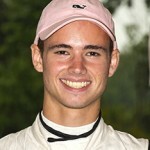 Jay had been competing with in karting for multiple years prior, which helped make the transition relatively seamless. Even with just two days of testing, I felt that I was at home in the race car. The debut came mid-way through what was already a very busy 2017 racing season for me. 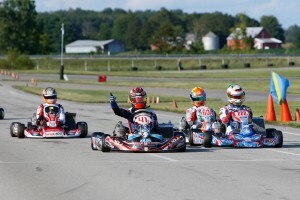 Up to that point, it had consisted of a mix of national and regional-level karting events. Obviously, this was by far the biggest event of that year. We had just barely scraped together the funding needed to compete, putting all of our chips in one basket. We didn’t have any spare room for crash damage or other unexpected expenses. We bet everything on that one race weekend. Success is F4 came quite quickly with Jay Howard’s team. Each F4 race weekend consists of three individual races, and I scored a second, a third, and a fourth in a solid field of 31 drivers. Building from such an awesome run, we were able to also put together the opportunity to finish off the last two weekends of the season later that year at the Circuit of The Americas in Austin, Texas. I remained inside the top group at nearly every session in those rounds as well, even scoring my first win to end the season with one win, six podiums, and seven top-five finishes in just as many starts. Just a surreal feeling to start on such a high note and ride that wave through to the end of the year. Riding the highs of 2017, I was able to put together a full season opportunity in F4 for 2018. I was ecstatic to get to racing, although I was quickly humbled as I faced many bits of adversity. In 2017, I finished inside the top four in every session. In 2018, bad luck and mechanical issues hampered my season. I never even cracked the top four, with my best finish being a fifth-place run at Road Atlanta. Halfway through my season, I had to make a very difficult decision. I was going to focus on getting more track time in different cars and different series. Therefore I decided to part ways with my long time team and coach Jay Howard, who had done so much to help me advance my career and turn me into the driver I am today. With such a lackluster season, I didn’t think I would even be considered to be nominated for the Team USA Scholarship. Jeremy Shaw saw through the bad luck and adversity, and ultimately helped me see it as a way to grow. His mentorship and actions helped turn my disappointing season that felt like a step backward into a forward leap towards my dream of becoming a professional racecar driver. The Team USA Class of 2018 at Mid-Ohio. When I received the email informing me that I was nominated for the Team USA Scholarship, I was absolutely thrilled. Win or lose, I knew from the start that the connections I would make and the experiences I would have would grow me as a person and a racing driver. I learned more from the first part of the selection process than I ever expected. 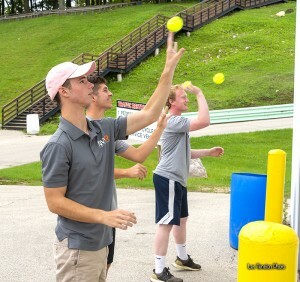 The Team USA Scholarship experience at Mid-Ohio was all about seeing how we Team USA nominees represented ourselves at the track. It was done on the grandest stage: in front of people that could change our lives in a heartbeat. We got to meet people like Mike Hull from Chip Ganassi Racing, Michael Cannon from Dale Coyne Racing, insiders of the Mazda Road to Indy, and many other people I’ve watched for years on TV following IndyCar. 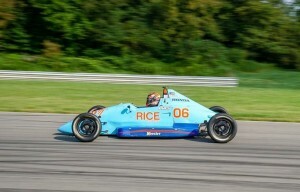 PittRace with Greg Rice was big morale booster (MotorClubMedia.com). 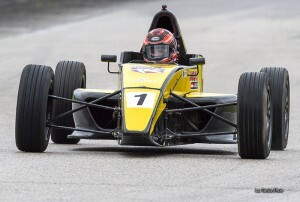 The first time back in a car after deciding to focus on getting experience in different cars and different series was one week later at Pittsburgh International Race Complex in a Rice Race Prepped F1600 car. I had no experience in the car and learned a ton, as well as having a successful weekend claiming two victories and a second place finish. Fast forward five weeks, I was flying directly from my USF2000 race in Portland to Chicago, where all six Team USA finalists met to drive up to Road America. 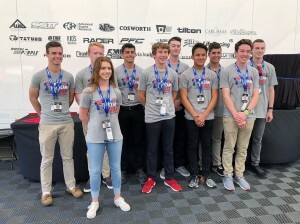 The famed circuit played host to the 2018 Team USA Scholarship Shootout in collaboration with Cooper Tires and the Lucas Oil School of Racing. The pressure was on in full force. 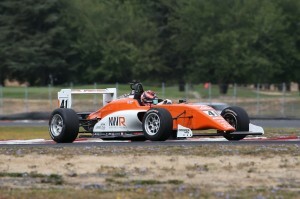 In the Newman Wachs USF2000 Tatuus at Portland. 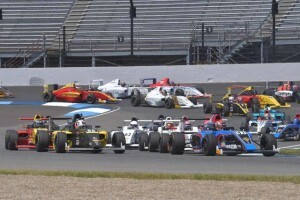 I had a strong run in my debut in the previous weekend’s Cooper Tires USF2000 Championship Powered by Mazda event in Portland, so I was feeling extremely confident and upbeat heading into the shootout. After getting through the standard off-track duties of a team track walk and a nice dinner, it was time try to get some sleep before heading on the circuit first thing in the morning. The Team USA Scholarship Shootout each year utilizes cars very similar to the F1600s that the scholarship allows you to race in England. They have no downforce and run very narrow tires to keep the difficulty level high even though the speeds regularly aren’t. In layman’s terms, driving these cars is a freaking blast. 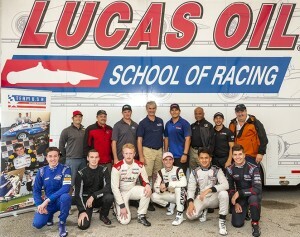 The Lucas Oil school cars were a blast to drive. We were greeted with a very wet version of Road America the first morning, which combined with the low-grip, no-downforce Lucas Oil Racing School cars made quite the challenge. It felt as though the car was dancing around the track. Any slightly wrong movement meant washing out of the groove and usually off the track entirely. The whole first day remained wet, so Day Two would be everyone’s sole chance at proving themselves in the dry. Only the final “race” ended up being truly dry, so I gave it everything I had. Even with all of the “one-off” opportunities I have had in the past, looking back this is the closest time I can honestly say that I drove every lap as if it were my last. The Team USA Scholarship decision process is very intense and even after everything that they put the drivers through, Jeremy Shaw and his team still take a few extra days to analyze and re-analyze each driver before making a final decision. With that in mind, I packed my bags, said my thank-yous and goodbyes, and headed home for what should’ve been the most agonizing week of my life…. At least, that decision-making week SHOULD have been gut-wrenching, anxiety-inducing and just plain frightening. Dating back to February of this year, anytime I attempted to use my left arm or upper pectoral muscles, I instantly was met with an immense amount of pain. The pain only got worse all year until it eventually all but paralyzed my arm whenever I’d try to use it in a racecar. My dad and I met with numerous doctors at various hospitals and medical centers to try and diagnose the issue to no avail. By the time the Team USA Scholarship Shootout rolled around, it was so excruciatingly painful to even loosely hold onto the wheel with my left hand that I literally drove one-handed for as long as physically possible in each and every session. As soon as I got home from Road America, I had another test. My dad gave me the good news that our latest doctor had found an aneurysm underneath my collarbone on my left side which caused blood clots to flow down the artery in my left arm. The clot was nearly 10 centimeters in length, and was a culmination of a number of little blood clots caused by the artery getting pinched and weakening over time. I spent the next two weeks in a hospital bed, undergoing two surgeries: the first to clear the series of blood clots in my arm, and the second to remove the aneurysm and removed my first rib to prevent the artery from becoming damaged in the future. In between the two surgeries, I finally got the call I had been waiting for from Jeremy, offering me the Team USA Scholarship and my first-ever overseas trip for car racing. I was on cloud nine, but that high quickly ended as my doctor informed me that following my second procedure I would be sidelined for six weeks. Life has a funny way of redirecting us sometimes. There I was, in a hospital bed, making a phone call to Jeremy to let him know that while I was honored to have been selected for the opportunity of my dreams, I had to decline due to medical reasons. Since then, I have been in physical therapy and working hard to get into peak race shape again. Fortunately, the motorsports world is filled with amazing individuals. From start to finish of our conversation, Jeremy was very understanding and empathetic. He knew that I would do anything to be able to be able to race in England and be a part of the Team USA Scholarship. I would like to especially thank every single person who took time to help us young drivers in our endeavors throughout the scholarship process. To every single judge at both Mid-Ohio and Road America, every person who spoke to our group at Mid Ohio, Jeremy Shaw, the Lucas Oil School of Racing, Cooper Tires and anyone else who contributed, thank you. This whole experience has been more than I could ever ask for. You might say this long-awaited story doesn’t have much of a happy ending, and you’d almost be right. But it’s not because my story won’t have one: I’m just not finished writing it yet….